Prime Minister Sheikh Hasina has presented a six-point proposal regarding the Rohingya crisis, including demands to return the refugees to Myanmar and an end to ‘state propaganda’ that labelled the ethnic group as ‘Bengalis’. Hasina made the proposal at a meeting of the OIC Contact Group at the United Nations headquarters in New York on Tuesday and urged the OIC countries to unite to tackle the crisis. “Today our Muslim brothers and sisters in Myanmar are faced with ‘ethnic cleansing’,” she said. The Bangladesh prime minister’s other proposals included an immediate end to atrocities against Rohingya Muslims, the creation of ‘safe zones’ in Myanmar for the protection of civilians, the immediate and unconditional implementation of the recommendations put forward by the Kofi Annan Commission, and urgent humanitarian assistance for the refugees from OIC countries until they can return to Myanmar. Hasina is currently attending the 72nd General Assembly of the United Nations, which began on Sept 19 and will continue until Sept 25. The meeting of world leaders began soon after militant attacks in the border state of Rakhine on Aug 25 triggered a crackdown by the Myanmar military which has forced hundreds of thousands of Rohingyas to cross the border into Bangladesh. Over 400,000 Rohingya refugees have fled into Bangladesh since the crackdown began, which Hasina called ‘the largest exodus of Rohingyas of all time’. UNICEF estimates nearly 60 percent of the refugees are children. If the situation in Rakhine state persists, UN agencies estimate the total number of refugees entering Bangladesh may hit one million. The UN has called the incident a ‘textbook case of ethnic cleansing’. 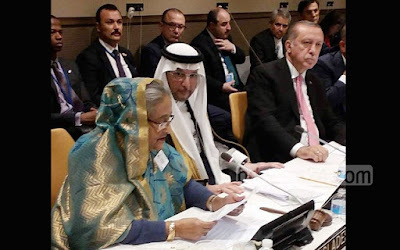 Hasina spoke of her own visit to the refugee camps at the OIC meeting and attempted to highlight the ‘grave suffering, particularly of women and children’. She urged OIC nations to visit Bangladesh and see the situation for themselves. She criticised Myanmar for claiming Rohingyas to be ‘illegal migrants’ from Bangladesh. The Rohingya Muslims are being forced out in a planned and organised manner, Hasina said. She referred to the minority’s exclusion from the list of Myanmar’s recognised ethnic groups, the denial of their right to citizenship in 1982 and their confinement to camps for internally displaced peoples. “We have continued our diplomatic efforts to return all the Rohingyas to their homeland,” the prime minister said. She urged the OIC countries to unite and resolve the crisis before it is too late. Bangladesh is ready to join any joint initiative on the issue, she said. 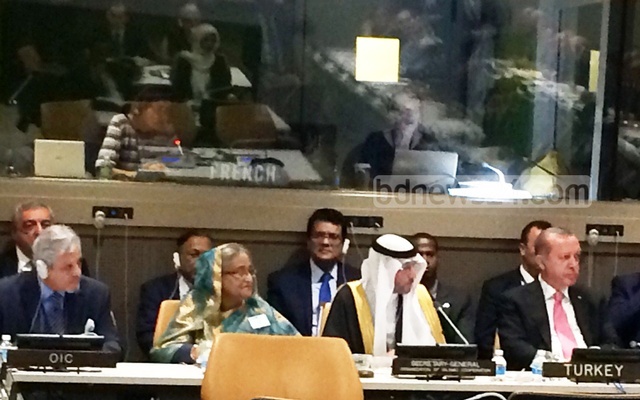 Hasina will speak on the Rohingya issue in her General Assembly address on Sept 21. She will meet with United Nations Secretary General Antonio Guterres for bilateral talks afterwards.